SSI Schaefer International has launched the Schaefer Case Picking (SCP) at CeMat 2008 in Hannover. The Schaefer Case Picking is a fully automated case-picking system that can handle almost all of the SKUs. 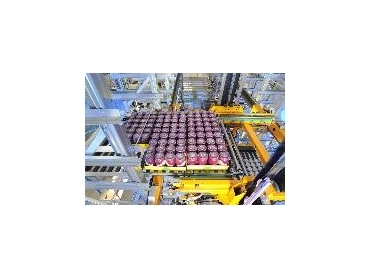 The Schaefer Case Picking can automatically select, palletise and stretch-warp stable, cube-optimised, mixed-case pallets. A few hours after it was launched at CeMAT, the Schaefer Case Picking was awarded the MM Logistik Award. The Schaefer Case Picking is suitable for any retail distribution process delivering missed and full-case pallets directly to store. Demanding environments like grocery, frozen, electronics and footwear are ideal industries for the Schaefer Case Picking. The Schaefer Case Picking has a simple linear process, good ability to manage customer specific pallet parameters and a highly-efficient picking process. The Schaefer Case Picking includes everything from goods receiving, de-palletising, buffering, order-picking, sequencing and customer specific palletising to the goods issuing department; every step of the warehousing process for ambient food and temperature controlled goods. The Schaefer Case Picking is a modular, scalable and expandable system with a performance of 30,000 to 300,000 cases per day. With this, the Schaefer Case Picking guarantees an economic solution to increase performance, quality and efficiency while simultaneously reducing the cost per case. The Schaefer Case Picking ensures flexibility and quality of delivery.